Bossy Italian Wife : Quick Fix: "Cafe Mocha"
So, generally I am a do it yourself kind of gal in the kitchen. I like making stuff from scratch--it makes me feel good. This is not one of those kinds of drinks. This drink is so fast it'll make your head spin. I actually have been thinking a lot about this drink for a couple of reasons, and I have to be honest, I almost didn't share it on here. At first, I was worried it was too simple; like people would be thinking it was too easy. But then I thought, "can something yummy be too easy?" Turned out the answer was no. If it's good, it's good, regardless of how many minutes it took. Then there is the fact that Christmas is just four days away. I feel like this drink is great for Christmas morning when you want something a little more special than plain old coffee. 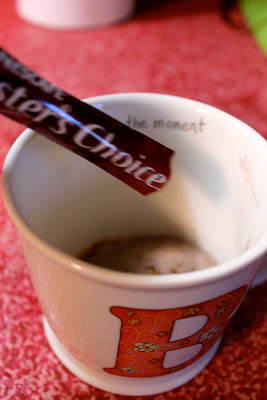 If you like hot cocoa and you like coffee, then this quick fix "cafe mocha" is for you. I love hot chocolate by Swiss Miss. My grandfather used to drink it when I was a kid, and so it reminds me of him. The instant coffee? I bought that for a party once, and I still had some around. So I thought to myself one chilly evening, why not mix the two together? I was HOOKED after that. While you are observing you are also heating up 8 ounces of water in the microwave. Two minutes and thirty seconds should do the trick. Pour your how water into your cup. 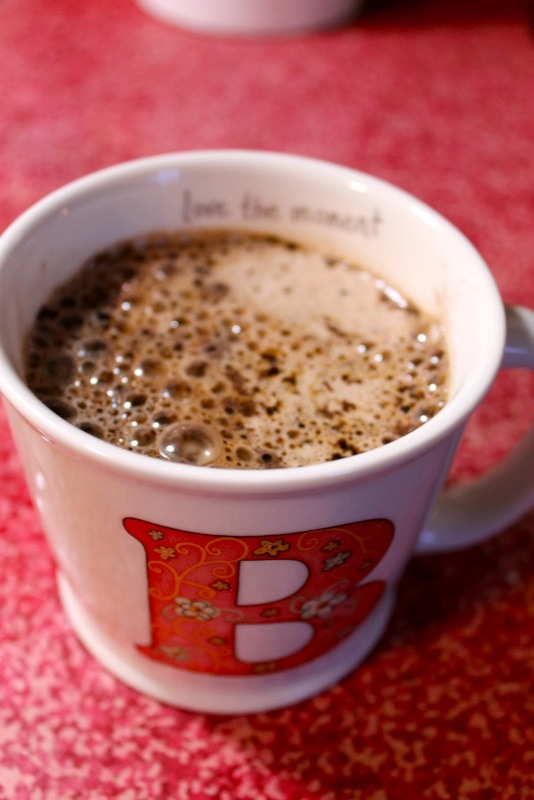 You are the master of the easiest cafe mocha in the whirled. Hehe. Yep, I said "whirled." Heat your 8 ounces of water in the microwave for approximately two minutes and 30 seconds. In a mug, add the cocoa mix and instant coffee granules. Pour the hot water over the mixes. Stir to combine. Enjoy how awesomely fast, easy and delicious that was. Labels: easy hot chocolate and coffee, hot chocolate drinks, instant coffee drinks.